At Jacob’s well, Jesus offers the Samaritan woman a different kind of water: “living water…welling up to eternal life.” He then asks her to summon her husband, but the woman explains that she is unmarried. Jesus, however, quickly reveals the whole truth: the woman is currently living with a man who is not her husband. In addition, she has been married (and likely divorced) five times before. Amazed by his knowledge about her, but ashamed of her sin, she tries to change the subject. She asks if worship should be held at the temple in Jerusalem or at the Samaritan temple on Mount Gerizim. But Jesus will not take the bait. He explains that the location of our worship is unimportant; rather there will come a time when all the faithful will worship the Father together in spirit and in truth. 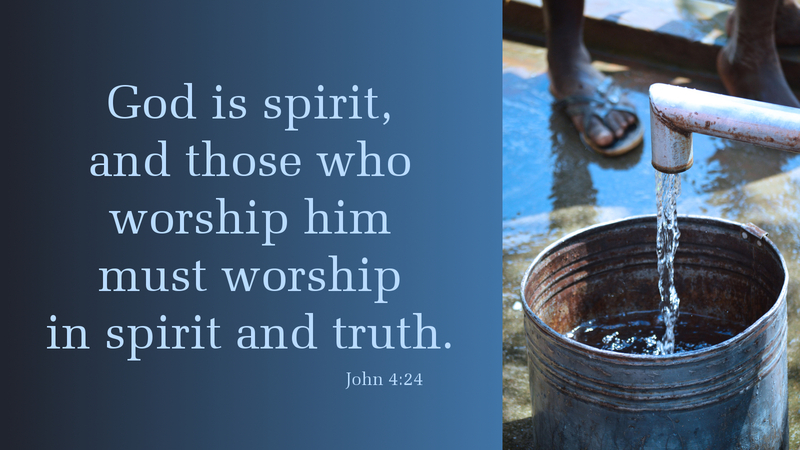 Prayer: Jesus, help us to be true to who we really are: redeemed sinners washed in living water, heirs of the Father who will one day join with all believers to worship him in spirit and in truth. Amen. Today’s devotion was written by the Rev. Dr. Dennis Di Mauro, Pastor of Trinity Lutheran Church, Warrenton, VA.